Party members will be lectured on theoretical subjects such as political sociology, the history of socio-political theories, political theory and philosophy. Source: Kommersant. Russian political leaders have started thinking about grooming their own cadres. Two political bodies have already announced plans to establish in-house schools. The first one, a United Russia school, should be up and running before the end of the year, Izvestia reported, citing sources within the party. 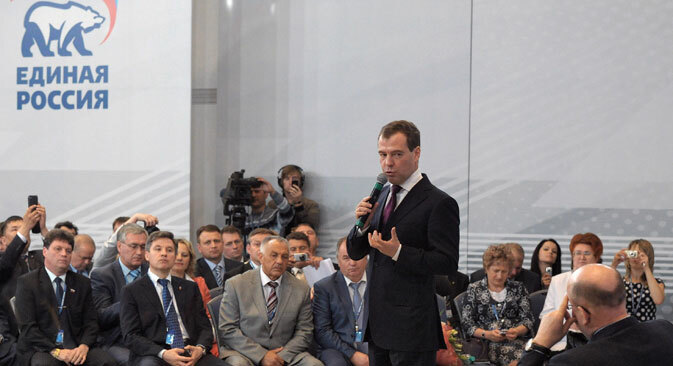 A draft framework for the school has already been developed and sent to Prime Minister Dmitry Medvedev for approval. It envisions “a comprehensive system of political education for party cadres.” Courses will depend on what job the trainees intend to take or where they are currently working. “Some courses will cater to future primary party instructors, while others are designed for regional branch staff employees,” the source told Izvestia. The framework comprises a total of 22 disciplines: United Russia members will study agitprop and propaganda techniques, counter-propaganda, media relations, web politics, public complaints processing, public speaking and debate preparation, and political planning and strategy. Party members will also be lectured on theoretical subjects such as political sociology, the history of socio-political theories, political theory and philosophy, modern party legislation, political management, and modern political analysis. Education will be part-time. Former presidential candidate Mikhail Prokhorov is also setting up his own academy. The entrepreneur has joined efforts with former Finance Minister Alexei Kudrin to establish the School for Civic Leaders. Prokhorov insists that his institution is non-political and geared toward training cadres, without “molding” them to work for any specific political force. “It is obvious that the existing state institutions are unable to meet the needs of the active portion of society to support their civic and social projects. Accordingly, people have been creating their own institutions that they can substitute for the state,” said Garmonova. This article is a combined report based on materials from Kommersant and Izvestia.